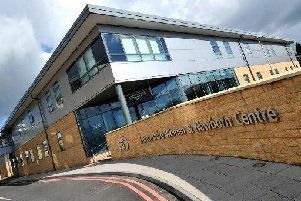 A specialist breast cancer charity has successfully raised £30,000 to buy a key piece of equipment for screening women for breast cancer at Burnley General Hospital. It is estimated that on average, 12% of women are diagnosed with breast cancer in their lifetime. However, in women with a family history of the disease, the figures are greatly increased to between 30 and 80%. Debbie Dowie, wife of football pundit Iain, was diagnosed with breast cancer in 2010. Fighting the disease inspired her to set up the “Boot Out Breast Cancer charity” which fund-raises for NHS Trusts across the North. Her latest event, a masquerade ball, was held recently to raise funds to buy a new MRI breast coil for Burnley General Hospital. Supported by the charity’s patrons Alan Shearer and Paralympic cyclist, Dame Sarah Storey, £30,000 has now been raised. She said: “I am just relieved that there is a piece of equipment that’s so fine-tuned that it can pick up the smallest of things. “It really gave me the reassurance that I needed. “My cancer was not detected by an ultrasound or a mammogram. The MRI, however, did detect it.